The elephant-eared chameleon (Calumma brevicorne) is the second kind of chameleon I’ve gotten the chance to encounter here in Madagascar, but so far only at night. That’s because, to the human eye, chameleons are easier to spot at night. During the day, our eyes get tricked by chameleon’s ability to change their color to blend in with their surroundings. But at night, our eyes can’t see color well and instead we look for shading; lighter-pigmented things stand out against the darkness. And that’s what happend with chameleons. Their light shading helps them stand out in the dark. Of course, I’m speaking relatively here. They’re not easy to find, but if you pay attention and know what to look for, they’re not impossible to find, either. 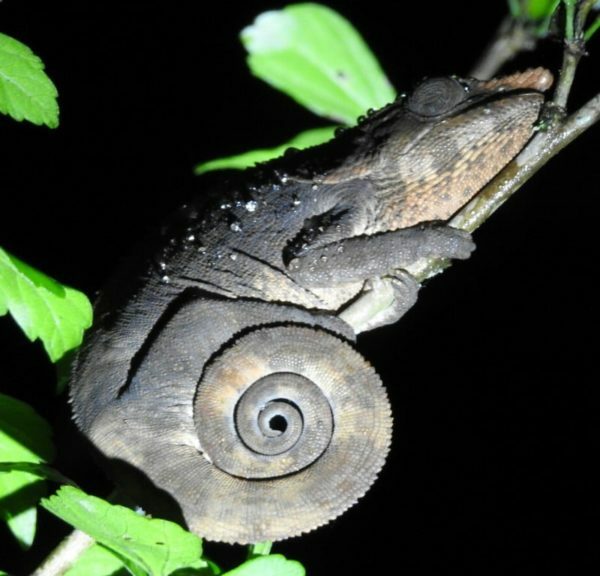 The elephant-eared chameleon is named for the big flaps of skin at the back of its head that look a little like, well, elephant ears. Another English name for this species is “short-horned chameleon,” because the males have a short, pinkish horn on their nose. Those whitish bumps on its skin aren’t warts. They’re just little droplets of moisture reflecting light from our headlamps.